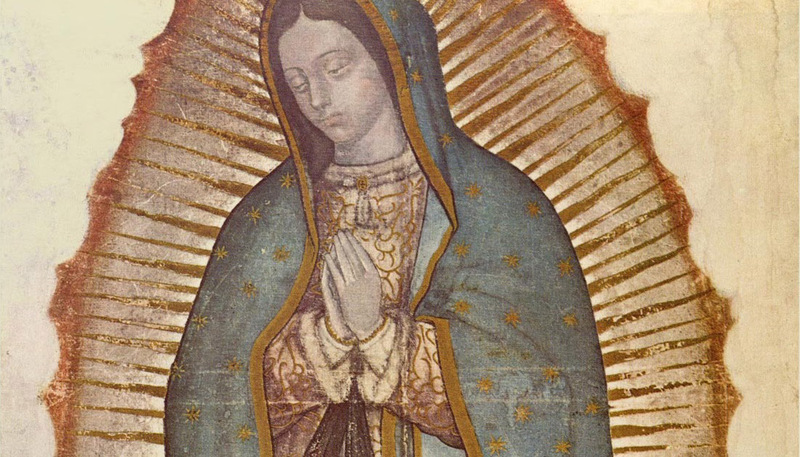 When Our Lady appeared in Mexico in 1531, she did not choose the most educated or the wealthiest person in Mexico City. She appeared to a poor peasant farmer named Juan Diego—a recent convert himself. She asked Juan Diego to petition the bishop to build a church on Tepeyac Hill so that she could offer her grace to those who visited the shrine. Juan Diego went to the bishop and told him about the apparition, but the bishop was not convinced. When Juan Diego returned to the hill and told the beautiful lady what had happened, she sent him with a sign for the bishop—roses blooming in December—which he carried in his tilma. When Juan Diego let the roses fall out of his tilma at the feet of the bishop, everyone saw the beautiful image of Our Lady of Guadalupe that was miraculously imprinted on it. After the apparitions, millions of native Mexicans converted to Christianity and millions more have visited the shrine of Our Lady of Guadalupe in Mexico City. As the patroness of preborn children, Our Lady of Guadalupe holds a special place of honor in the pro-life movement. Our Lady shows us how precious and sacred every human being’s life is. As the Mother of God, Mary played a special role in caring for Jesus from His earliest moments on earth. When we pray for the intercession of Our Lady of Guadalupe, we know that she understands the need to protect the tiny preborn babies as well as their moms. Countless lives have been saved and many moms have found help in difficult situations through Our Lady’s intercession. One of the most important things we can teach our children and students is how to develop a close relationship with Our Lady. She is the one who can bring them to Jesus and she has a special love for preborn babies, making her the perfect intercessor for them. We should remind students that they can go to Our Lady for help at any time. She is our mother and she is there for us in our every need. We can also call upon her to help moms who are with child—especially those facing difficult pregnancies. Just as our mothers love us, our heavenly mother loves each of her children. Our Lady of Guadalupe: Honoring the Patroness of Preborn Children gives K-2 students an overview of the apparitions of Our Lady of Guadalupe as she appeared to Saint Juan Diego, engages students in a discussion of prayer for preborn babies, and concludes with an ornament craft. The feast of Our Lady of Guadalupe is tomorrow, December 12.